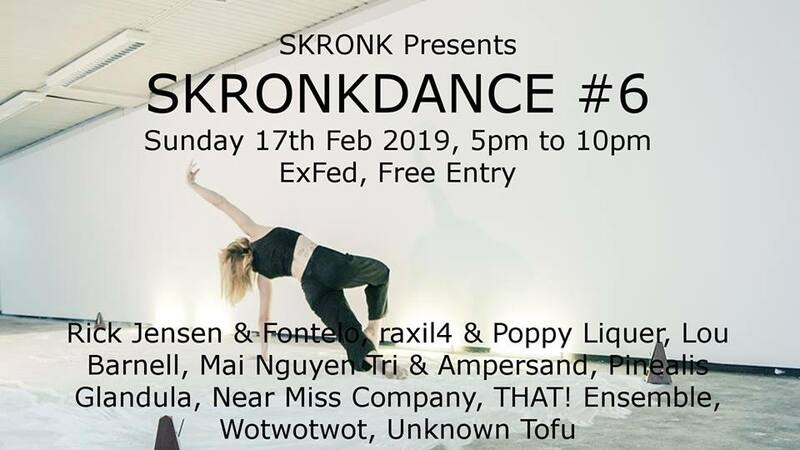 Number 6 in SKRONKDANCE, this time we’re moving around the corner to the much bigger space in ExFed for what will be the most spectacular SKRONKDANCE to date, featuring several returning performers and some new ones. We’re going to outdo ourselves here. Rick Jensen & Fontelo, raxil4 & Poppy Liquer, Lou Barnell, Mai Nguyen& Ampersand, Pinealis Glandula, Near Miss Company, THAT! Ensemble, Wotwotwot, and finally the very surprising Unknown Tofu, soemthing you must experience. More details coming soon, but get this on in your calendars now. This is a big event so make sure to be on time as we will be running a tight schedule.